Late last year, the United Nations vowed to intensify the fight against a deadly cholera outbreak its peacekeepers inadvertently carried to Haiti. To date, however, the UN has raised just a small fraction of the estimated $400 million needed over the next two years to wage that campaign, according to a letter from the new secretary-general. “The voluntary contributions that have been received are not yet sufficient and constitute only 2 percent of the amount," Antonio Guterres wrote in the letter sent last week to permanent representatives of the international body. That would mean about $8 million. The letter said that as of February 8, five member states -- Chile, France, India, Liechtenstein and South Korea -- collectively had pledged almost $2 million to a U.N. multi-partner trust fund. Outside of that fund, Japan has promised $2.6 million and Canada has committed about $6 million. Guterres’ letter asks all member states to notify him by March 6 of their intentions to help finance the campaign. Separately, the U.S. government committed $2.9 billion to recovery and reconstruction efforts after a devastating quake in early 2010. U.N. peacekeepers arriving from Nepal are believed to have caused Haiti’s current epidemic, which broke out near a U.N. base in October of that year. Since then, more than 788,000 people have been diagnosed with the infectious disease and at least 9,000 have died. The U.N. also outlined a response along two tracks: reducing cholera and aiding victims. It aims to trim the number of annual cases from the current 30,000 to fewer than 10,000 by the end of 2018. 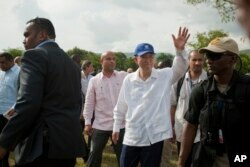 It also plans to ensure that all Haitians have access to clean drinking water and to toilets by 2030. Only a quarter of the population now has access to toilets, the letter said. Vibrio cholerae bacteria spread through food and water contaminated by an infected person’s feces, according to the U.S. Centers for Disease Control and Prevention. The infectious disease is most prevalent in places with poor sanitation and health systems. 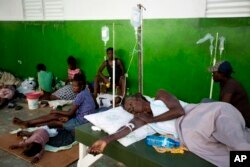 Victims of cholera receive treatment at a cholera center in Anse D'Hainault, Haiti, Oct. 11, 2016. 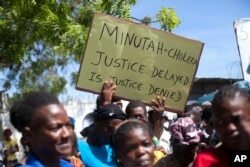 Relatives of 5,000 Haitian cholera victims initially sought legal redress in 2011 from the United Nations, whose Office of Legal Affairs said their claims were “not receivable,” The New York Times reported last August in a story on the U.N.’s admission of a role in the epidemic. Other litigation still is pending. The trust fund provides a means by which the U.N. intends to provide “material assistance” to aid Haitians most affected by the epidemic. Brian Concannon is executive director of the Institute for Justice and Democracy in Haiti, a nonprofit organization that represents the Haitian cholera victims and their relatives. He told VOA that at one point, half of the anticipated $400 million was earmarked for victims – either through community-based projects such as new hospitals and schools or through direct compensation to the families. But “the main story is there’s not much money,” Concannon said, noting that some have cautioned his clients “to recalibrate their expectations", but countered that "the cholera victims have a right to compensation under international law. The UN needs to recommit to fulfilling its promises to obey the law." Gabriel Thimothé, general director of Haiti’s Ministry of Public Health, said Haitians “have not given up hope” that the U.N. will meet its funding goal. Meanwhile, Thimothé said the ministry is trying to reduce infections. It dispensed a million vaccine doses - provided by the U.N.’s World Health Organization - in the country’s south after a devastating hurricane in October, and it’s planning a nationwide vaccination program. The ministry also is teaching good hygiene practices and providing potable water. For VOA Creole Service stories, see www.voanouvel.com.